Set amidst the backdrop of the 2008 housing market catastrophe, Dennis Nash, a hard-working and honest man, can’t save his family home despite his best efforts. Thrown to the streets by real estate shark Mike Carver, Dennis, out of work and luck, is given a unique opportunity – to join Carver’s crew and put others through the ordeal done to him in order to earn back what’s his. 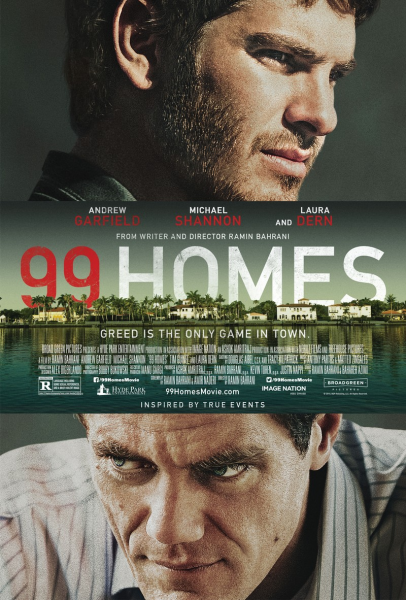 Fueled by powerful acting and a taut, patiently constructed narrative, 99 Homes is a modern economic parable whose righteous fury is matched by its intelligence and compassion. Free! Please register here so we know how many to expect.